FxCraft Price Ladder is a convenient tool which shows DOM (Depth Of Market) for manual trading on the JForex platform (Dukascopy). It is perfectly suited for dynamic scalping and traditional day-trading. The tool based on Luktom Price Ladder. Easy setting the parameters for long and short positions. See the depth of the market displayed with bars on the ladder. There is shown available in Dukascopy ladder volume on both side and the cumulative volume divided on Ask and Bid from the selected period. All bars are scaled to the max value from bid and ask volumes. Trade with just one mouse click (@ Market and pending orders). To place an order with market price, click the SELL MKT (BUY MKT) button. To place pending order, single left mouse click on desired price on ladder on first column for short orders and on the last column for long orders. The application automatically detects what type your pending order should be (STOP or LIMIT), depending on the location of a current price in relation to the “clicked” price. Automatically set stop loss and take profit on selected levels. The values of stop loss and take profit are given in pips. It is also possible to disable those option. See dynamically calculated lot size. Lot is calculated based on the percentage of capital which can be accepted as a maximum loss, set stop loss value and a commission charge, according to the formula: (Balance * Risk-commission) / (SL * PipValue). Lot is calculated and displayed in the ‘Amount’ box by clicking the ‘calc’ button or the ‘SELL MKT’ / ‘BUY MKT’ button. To disable this option and play with a fixed lot, uncheck the ‘Risk’ box. Close positions with just one right click. All open short (long) positions can be closed with the ‘x’ button on the left side (‘x’ button on the right side) of the application. All pending short (long) positions can be closed with the ‘c’ button on the left side (‘c’ button on the right side) of the application. 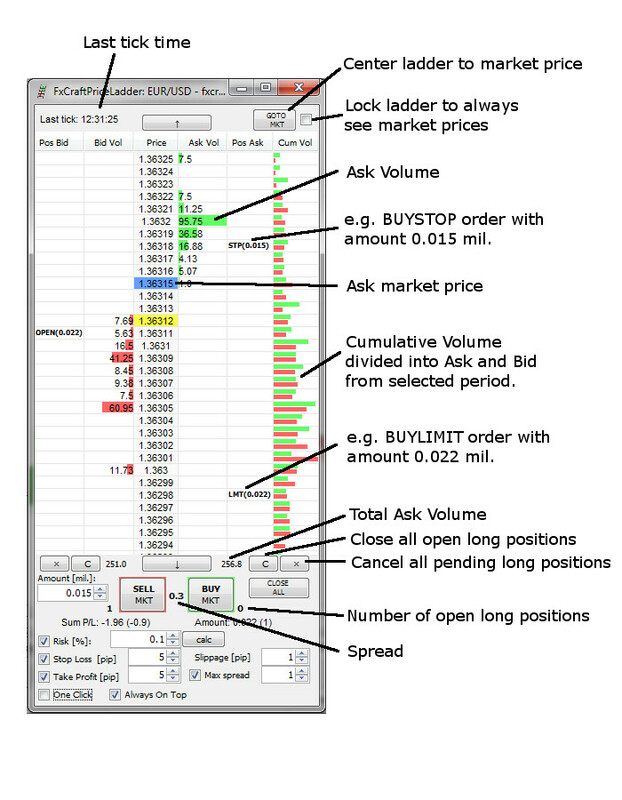 All positions (short, long, open and pending) can be closed with the ‘CLOSE ALL’ button. Fast order submitting. If ‘One Click’ box is selected the application don’t ask for confirmation when placing/canceling orders, removing stop loss/take profit and closing positions. Use ‘trailing stop’ and ‘breakeven’ in positions opened by the program. While launching the program (or while it is working, by right-clicking the mouse on a strategy and selecting ‘Parameters’), you can set parameters for trailing stop and break even. For trailing stop, set the number of pips that a position has to earn to activate trailing stop and the number of pips indicating how far from the price stop loss will be shifted. Number of open positions divided into short and long (they are displayed next to the keys, “SELL MKT” and “BUY MKT”). Total profit / loss (“Sum P / L”) in the account currency, and next in parentheses in pips. If there is more than one open position we calculate the breakeven level. Value of Total profit/loss is distance beetween breakeven level and current price. Both values take commissions into account. Time of last tick is displayed over the ladder. When there are few orders on the same side and price only the first one is displayed on the ladder. When right click on such “multiple” position the application closes/cancels all of them. Now you can start FxCraft Price Ladder. In JForex platform in Strategy tab to open multiple instances of the same product (strategy). Select every time the same file.Now you can run the program on each instance separately, in each choosing a different currency pair. There is a new tool functionality – the cumulative volume for a given price displayed in a new column. The volume can be divided into the Ask and Bid or display accumulated both prices. Displays the cumulative volume of the user-selected period and is updated in real time.